Sabbatical. Liberty. Furlough. Interlude. Break. Bring it on! Closing up the retail side of 23 Sandy Gallery, selling the building, moving and all that madness took entirely too long. Running the gallery for 10 very successful and satisfying years took a bit of a toll on this maker’s soul. I longed for studio time every day during those zillion-hour-a-week years of showing the world the glory of book art, organizing exhibitions and working with so many very talented artists. Hopefully, very soon, life will settle down to the point where I can get back into the studio and re-establish my creative practice. In the meantime: Thank You Books. A series of books celebrating the first 10 years of 23 Sandy, all free, open-edition books, perhaps one-sheet wonders, perhaps not. But, all aimed at thanking the oh so many artists, librarians, visitors and supporters of the gallery. The first book: GBW Tacoma 2017. Book #1 in this series of thank you books was made as a keepsake for the Guild of Bookworkers Standards Conference held in late October in Tacoma, Washington. I have been a member of the Guild of Bookworkers for nearly 20 years and it was great fun to hand out the books to my many guild friends and say thank you for the inspiration, education and support. The photos in the book are vintage “Roadside Americana” in Tacoma. You can download a free PDF of the GBW Tacoma book here or by clicking on the thumbnail at left. Print on 11 x 17 inch paper then follow the step-by-stop instructions to cut and fold into the miniature carousel book shown above. I printed mine at Staples on 67# card stock for about a buck and they look great. You could also reduce to fit on whatever size paper fits in your own printer for an even smaller miniature book. ***UPDATE 1/13/18*** A second version of this sweet little book was created to celebrate the Puget Sound Book Artists Annual Meeting in January 2018. Click here to download the PSBA version PDF. Plus, you can learn more about the superbly-organized and always-inspiring PSBA here. Sabbaticals are meant to be a defined period and my plan is a year of making, which will hopefully begin in April 2018. But, have no fear, during this creative interlude, I’m still making time for a bit of private artist book dealer duty. I just hope that I don’t squander this opportunity to create! Portland is a great city for the arts in general, particularly book arts. Here is a list of schools, suppliers, organizations and other resources that support the book arts by offering inspiration, education, supplies, resources, and networking. The book arts community in our region has a vibrant history and welcomes new and established artists. The following venues offer a wide variety of book arts classes and workshops. Check their websites for complete information. Guild of Bookworkers Northwest Chapter (more info below) – Our local chapter of the Guild has recently decided to increase their workshop offerings. Plans are the works to bring in some big names in technical binding techniques, so stay tuned. Editions – A co-working space for book artists and printmakers in Seattle started by Sarah Mo. Exciting plans for workshops, co-working space, gallery exhibitions and more. More info here. Portland Book Arts Group (P-BAG) – This group of friendly book artists meets monthly to share inspiration, techniques and projects. For more information, or to be added to the email list, contact convener Becky Luening at portland.bag@gmail.com or 503-774-9197. These suppliers offer a vast inventory of book making materials and supplies right here in Portland. Check the websites for locations nearest you. All have helpful staff, are fun to explore, and will inspire you. Many also offer workshops as well. Perhaps you want to hire someone to bind your book for you. These local binders and book artists do commission binding, box making and can even be hired for private instruction. 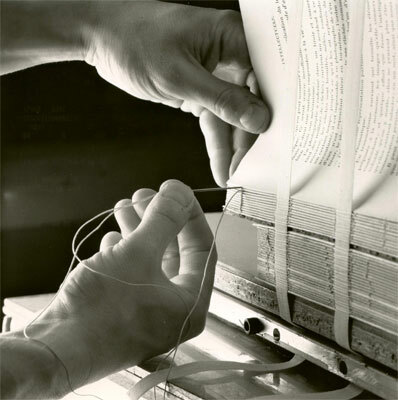 Book Arts Newsletter – Sarah Bodman is a Research Fellow for Artists’ Books at the Centre for Fine Print Research at the University of the West of England, Bristol, UK. As part of the center’s investigation of contemporary book arts practice they publish the Book Arts Newsletter, a free PDF journal that comes out (almost) monthly. Includes postings of exhibitions and opportunities both here in the US and abroad. Also watch for the Artist’s Book Yearbook, a biennial publication with essays and information on many aspects of the book arts, and The Blue Notebook, journal for artists’ books and several other publication. Sarah and Tom Sowden also produce book arts exhibitions, conferences and more as part of their research to explore many aspects of artists’ publishing. Sarah is also a talented book artist herself and the author of Creating Artist Books. Pay attention to what’s going on across the pond, it is all very exciting and inspiring. This list was compiled by Linda Kiley and Laura Russell. Please feel free to email Laura at 23sandygallery@gmail.com if you have any additions or updates to this list.